15 Embarrassing Instagram Marketing Mistakes (and How to Avoid Them). 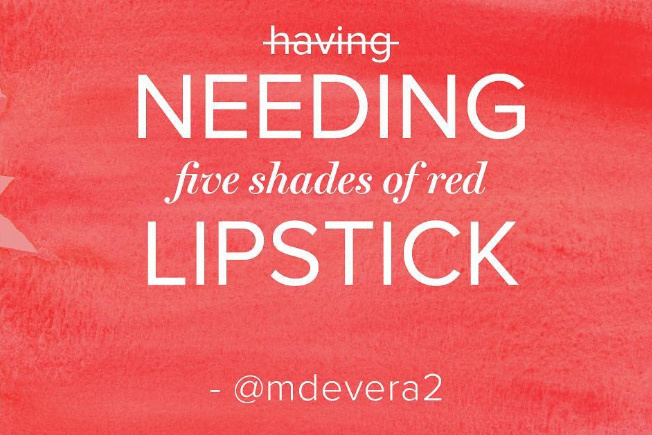 These brands slipped up big time on Instagram. Here's what you can learn from them. Instagram can be an amazing platform for telling your brand’s story in a creative, visually inspired way. Or, it can be a minefield of humiliating goofs, blunders, and gaffes. What they didn’t anticipate was that the picture would go viral, with over 3,000 people reposting the image within a few hours. The company just couldn’t keep up with demand, and soon their inbox was swamped with angry customers who feared they wouldn’t get their swimsuit in time to dress up for the midnight premiere of the Baywatch remake. So, what’s the takeaway? Even if you want your Instagram campaign to go viral, never make promises you can’t keep—and that goes double for promises that involve giving away millions of dollars worth of free products. Source: Teen Vogue / Instagram. What can we learn from this? Your public comments on social media reflect on your brand, especially if you’re high up in the company. Also, if you simply must blast out insults at your loyal customers from your personal account, please remember to proofread them first. Scott copy-pasted protein shake company Bootea Shake’s suggested caption directly into his promotional Instagram post, including their directions to post precisely at 4 PM EST. Both Scott and the brand were quickly mocked by dozens of his followers. Sounds like a textbook Instagram mis-shake. Lesson learned: if you have influencer marketing plans, be careful who you partner with—make sure they’re a natural fit for your brand. Customers can sniff out forced collaborations like blood in the water—and they’re not hard to notice when your brand ambassador literally leaves ad copy in their post. Influencer marketing is a lot like dating–you need to be careful who you partner with, and you don’t want your partner reposting your private messages on Instagram. 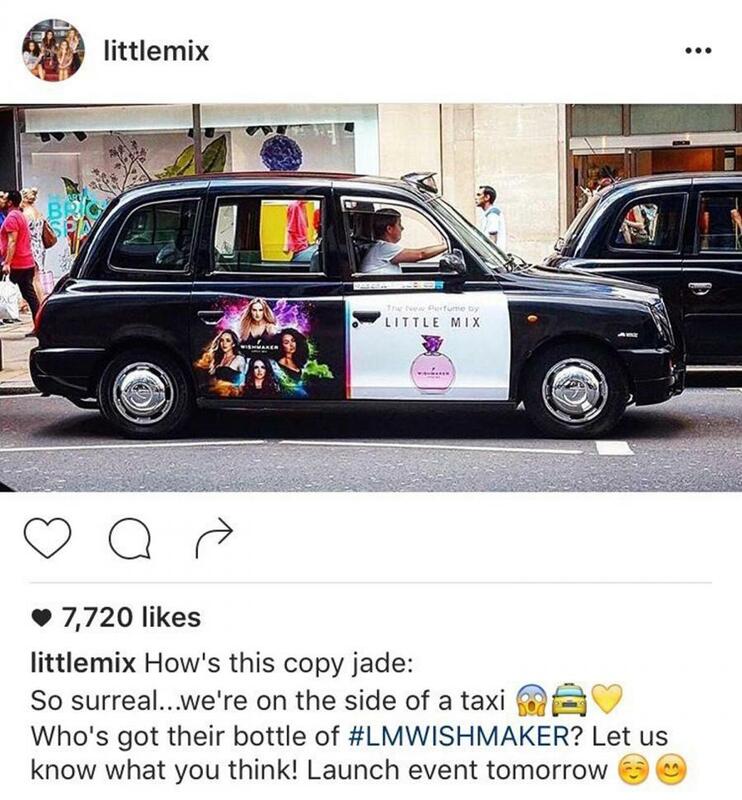 In an embarrassing flub a la the Scott Disick example above, British pop group Little Mix took social copy from the marketer promoting their branded perfume and put it into their caption verbatim. 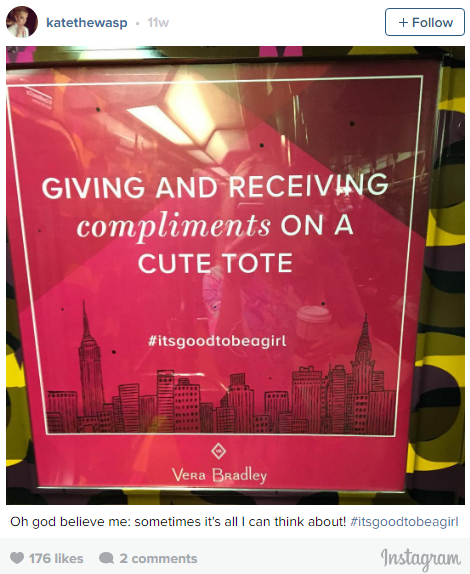 Unfortunately, their shock at being featured on a taxi didn’t come across as totally genuine once people realized it was written by a marketing department.
.@verabradley #itsgoodtobeagirl? Because patterned accessories are assigned a gender. Your ad campaign is disappointing. Maybe this ad campaign would fly in the 1950s, but not these days. Know your audience, respect their dignity, and be in touch with their beliefs and values. The internet is a minefield of strange hobbies and unique fandoms. So it’s hard to blame wholesome British baking company Warburton’s for not being familiar with furries, an online community of people who enjoy dressing up as anthropomorphic cartoon animals. While this wasn’t entirely their fault, even a few minutes’ research on their chosen hashtag could have avoided this awkward Instagram marketing mistake. So, before you launch your next hashtag campaign, don’t be like Warburton’s—just take a quick look and see if the tag is already being used by an internet fandom of people who like to dress up in cartoon animal costumes. Some marketers are of the opinion that all press is good press. If that’s the case, LA-based canned wine brand Nomadica Wine was pretty successful with this viral Instagram stunt. Nomadica promoted a new line of canned rosé by painting three abandoned homes in Mid-City, Los Angeles bright pink. However, in a big-time Instagram marketing mistake, event organizers failed to ask nearby neighbors if any of this was okay, drawing their fury along with that of many Instagram commenters. For future reference, it helps to get permission for your Instagram art project before you launch. Also, when an entire community is upset with your brand, try to make things right instead of thanking them for starting a valuable dialogue. Instagram is a great platform for visual storytelling. That being said, you need to be careful with what story…you’re telling. At best, the photo came off as tasteless. At worst, consumers found it deeply offensive. On a platform as visual as Instagram, optics are everything. Hopefully next time their social media manager will take that into account. Keeping Up With the Kardashians stars Kendall and Kylie Jenner just wanted to showcase their favorite musicians and earn a bit of spare change. At least according to their lawyers. Needless to say, this did not go over well with the Instagram community or the artists’ families, leading the Jenner sisters to promptly pull the shirts in shame. So: check your Instagram campaign for copyrighted images before you launch it, and don’t borrow dead people’s likenesses without permission. The moral of the story: be careful making broad statements on social media about who should and should not use your products, especially when you’re telling off an entire gender. Little did they know that Instagram is home to a large and engaged vegan community, who promptly started the #BoycottRuffles campaign in response to this perceived insult. There’s nothing wrong with throwing some light-hearted humor into your next Instagram campaign–just avoid mocking potential customers when you do it. Makeup company Lime Crime ran into quite a bit of controversy on Instagram when a large number of their customers complained that their credit card information had been hacked after purchasing goods through the brand’s website. Source: Fake on the Outside. Important lessons? Keep your customers’ data secure (particularly if “Crime” is part of your brand name), and if you’re thinking of making your public apology in the form of an emoji-ridden Instagram post, perhaps reconsider. 13. Trustyshoppe keeps repeating images..with slightly different text. It’s often said that variety is the spice of life. With that in mind, it’s important to keep your company’s profile looking rich and varied to avoid the Instagram marketing mistake of redundantly redundant redundancy. Reposting the same photo three times in a row with slightly different lighting or tiny changes to the text? Not the best way to hold customers’ attention. In yet another style industry fiasco and massive Instagram marketing mistake, makeup brand ColourPop came under fire on Instagram for their racially insensitive makeup names. After all, two of the darkest shades of their new line of “sculpting stix” advertised on Instagram were entitled “Yikes” and “Typo”. There was a huge outcry from the Instagram community given that these “sculpting stix” marketed to minority customers were named after synonyms for disastrous mistakes. But the only disastrous mistake here…was the marketing campaign itself. A) The easy one: don’t have a racist marketing campaign. B) The backlash incurred by tone-deaf product and brand names can easily go viral and blow up all over social media. Like ColourPop and Ruffles, Z Palette realized things had gone really wrong for them on Instagram when users started a hashtag calling others to boycott their brand. On the bright side, at least they were trending! Yikes. This (and many other rude responses from Z Palette’s social media manager) led to a #BoycottZPalette campaign taking off on Twitter and Instagram. That eventually led to a false apology from the CEO which was later deleted. In the end, several websites that carried Z Palette’s products dropped them due to public pressure. What’s the lesson here? First, be polite to potential customers. Second, if you have a social media crisis on your hands, offer an actual apology and try to make things right with your followers. And finally, don’t insult your customers, tell them you don’t need their money, then mock them in a fake apology….I guess. Enjoyed the article? For more tips on Instagram strategy, check out these 21 tips to massively boost engagement or these 11 ways to increase your organic reach. And the next time your competitor makes Instagram marketing mistakes like these, make sure you’re prepared.